The Siddhar (Tamil: Cittar from Tamil cittu meaning intellect, singular Cittan) refers to intellectual people in Tamil language, from ancient Tamilakam, and was written only in Tamil language. A siddhan obtains intellectual powers called siddhi by constant practice of certain educational disciplines. Historically, Siddhar also refers to the people who were early age wandering adepts that dominated ancient Tamil teaching and philosophy. They were knowledgeable in science, technology, astronomy, literature, fine arts, music, drama, dance, and provided solutions to common people in their illness and advice for their future. Some of their ideologies are considered to have originated during the First Sangam period. Typically Siddhars were saints, doctors, alchemists and mystics all in one. They wrote their findings in the form of poems in the Tamil language, on palm leaves which are collected and stored in what are known as the "Palm leaf manuscripts". These are still owned by some families in Tamil Nadu and handed down through the generations, as well as being kept in public institutions such as universities in India, Germany, Great Britain and the United States. In this way Siddhars developed, among other branches of a vast knowledge-system, what is now known as Siddha medicine, practised mainly in Tamil Nadu as a type of traditional native medicine. A rustic form of healing that is similar to Siddha medicine has since been practised by experienced elders in the villages of Tamil Nadu. (This has sometimes been confused with Paatti Vaitthiyam" and "Naattu marunthu (forms of traditional Tamil medicine) and Mooligai marutthuvam (Ayurvedic medicine)). Siddhars are also believed to be the founders of Varmam - a martial art for self-defence and medical treatment at the same time. Varmam are specific points located in the human body which when pressed in different ways can give various results, such as disabling an attacker in self-defence, or balancing a physical condition as an easy first-aid medical treatment. Tamil Siddhars were the first to develop pulse-reading ("naadi paarththal" in Tamil) to identify the origin of diseases. This method was later copied and used in Ayurveda. The Abithana Chintamani encyclopedia states that the Siddhars are either of the 9 or 18 persons listed below, but sage Agathiyar states that there are many who precede and follow these. Many of the great Siddhars are regarded to have powers magical and spiritual. The siddhars are believed to have had both major and minor powers which are described in detail in various yogic and religious texts. They also are said to have the power of converting their mass to energy and thereby travelling to different universes. These eight are the Great Siddhis (Ashtama siddhis), or Great Perfections. ^ Meditation Revolution: A History and Theology of the Siddha Yoga Lineage. Motilal Banarsidass. 2000. ISBN 9788120816480. ^ S. Cunjithapatham, M. Arunachalam (1989). Musical tradition of Tamilnadu. International Society for the Investigation of Ancient Civilizations. p. 11. ^ Journal of Indian history, Volume 38. Dept. of History, University of Kerala. 1960. ^ Weiss, Richard (2009). Recipes for Immortality : Healing, Religion, and Community in South India: Healing, Religion, and Community in South India. Oxford University Press. p. 80. ISBN 9780199715008. ^ V. Jayaram. "Study of siddhas". Hinduwebsite.com. Retrieved 2013-06-22. ^ "18 siddhars". Palanitemples.com. Retrieved 2013-06-22. ^ "Siddhars". 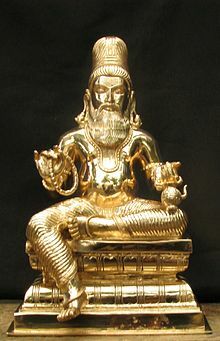 Sathuragiri.org. Retrieved 2013-06-22. ^ "Ashtama Siddhis". Siddhars.com. Retrieved 2013-06-22.